Stage 1 of the Tour de France sees the riders head out from Passage du Gois, a causeway linking the Ile de Noirmoutier and Beauvoir sur Mer that is submerged twice a day during high tide, head down the coast as far as Les Sables d-Olonne, before heading inshore, eventually reaching the finish at Mont des Alouettes. Despite being a predominantly flat stage, there is a slight ramp up at the finish. The final 2km rises at a gradient of around 5%, meaning that it is likely that the natural sprinters are unlikely to fancy the win. Instead, it leaves it open for some of the puncheurs, who might fancy the opportunity to become the first rider to wear the Maillot Jeune in the 2011 Tour de France. Philippe Gilbert starts as a big favourite with the bookmakers (biggest price 6/4 with Paddy Power) and rightly so. Coming off a fantastic year thus far, having become only the second man in history to win all three of the Ardennes classics, as well as winning the Tour of Belgium and the Belgian national road race and a third place finish in the Milan-San Remo race. He has also won stages of both the Giro d’Italia and the Vuelta a Espana before, so a stage of Le Grand Tour is the only accolade missing from his collection. Looking beyond the Belgian, Thor Hushovd is fancied at a best price of 13/2 with numerous bookmakers. One of the few sprinters who might fancy a shot at the win, he will be eyeing a strong finish to take an early lead over Mark Cavendish in the race for the points jersey, but it will be tough for him. If he can stay with any breakaway at the end, his sprinting ability may give him the advantage, but he may struggle to stay with them. The other sprinter to keep an eye on is Team Sky’s Edvald Boassen Hagen (best price 22/1 with Victor Chandler). He has been a doubt for the race after battling a bout of shingles, but he is set to start, suggesting he is fit once again. A big, powerful sprinter, he has the ability to hang in there with the breakaway and if it comes down to a sprint, he will be right in amongst the leaders. One rider in particular to watch is Astana’s Kazakh rider, Alexandre Vinokourov. He has stated that his goal for the race is to wear the yellow jersey at some stage and the finish to this stage would appear to suit him perfectly. He has won classics before and knows how to win, so he will fancy his chance to take a win here. Two other riders who might fancy giving the French fans something to cheer on the day are Thomas Voeckler and Jerome Pineau. Thomas Voeckler has good memories of this area after winning the French national road race there last year, whilst Jerome Pineau finished second to Alejandro Valverde in a very similar first stage three years ago in 2008. Finally, the Slovenian rider, Grega Bole, is a rider who might fancy his chances of a good finish here. He is not really a natural sprinter, but is not exactly a natural climber, but possesses some of the talent of each, so may fancy a big push in the final metres of the stage to claim a first ever stage win. In conclusion, Philippe Gilbert is the big favourite and is likely to win the stage and take the yellow jersey. However, at odds of 6/4, it is hardly an appealing proposition. 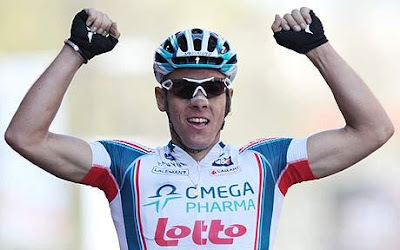 Instead, Boassen Hagen, Vinokourov, Voeckler, Pineau and Bole are potential shouts at slightly larger odds. As a slight safety net if Gilbert were to win, each of these could be taken each way at 1/4 odds for the first three places.